Berkeley Rep stages a Grimm tale with feminist overtones. Audrey Brisson as the Handless Bride. Maybe fifteen minutes into the first act of The Wild Bride is when it will hit you: Yes, you've heard this story before. Perhaps from The Brothers Grimm, or perhaps — if you're into feminist literature and Jungian analysis — in the 1996 anthology Women Who Run With the Wolves. Or maybe you saw Amy Sass' interpretation of the production Handless, staged last year at a small industrial venue in Richmond. It turns out the story of the handless maiden is a perennial; there's a Swahili version, an Italian version from the 16th century, and a retelling by author Margaret Atwood. All of them hew to the same storyline: A man makes a deal with the devil that somehow results in his daughter's hands getting chopped off, and later growing back. What happens in the interim is a matter of great dispute, though it often involves the daughter's exile, a winding journey through a dense wood, and a very sweet, improbable love story. In Emma Rice's new adaptation — produced under the auspices of her UK-based theater company, Kneehigh — the characters bring warmth and humor to events that might otherwise seem grisly. After all, it's hard to win an audience over with stories of female mutilation, even if you couch them in the language of fairytales. In fact, Rice faced several challenges in adapting and directing The Wild Bride, which runs through January at Berkeley Repertory Theatre. One is magical realism, since she had to convey not only the amputation and reassembly of body parts, but also the magic pear tree that feeds our title character, and the slithery devil who lingers throughout. More problematic, even, are the rifts of time and space that occur within this script, making it unlike a typical drama. Whereas most plays heighten the action by compressing the environment, Wild Bride does the opposite: It shows a woman's journey from her childhood home, through a great wood, to a royal court, and ultimately, back into the wild. Rice and her set designer, Bill Mitchell, solved that problem with the logic that small is big and less is more. Thus, the centerpiece of their play is a large treehouse, which serves as home, wood, castle, space of innocence, and site of the woman's brutal deflowering (or hand-hatcheting, if you prefer). Mitchell's set is brilliantly low-tech, and it accommodates the story very nicely. A cluster of dangling lightbulbs signifies the pear tree. A cheesy Renaissance portrait symbolizes the prince's mother. Disorderly piles of autumn leaves stand for the rambling wood. Such shorthand proves effective for a story that might otherwise careen in many directions. The director also found a convenient way to illustrate vast shifts in time by having three different actresses play the female lead. Lovely, delicate, doe-eyed Audrey Brisson plays the young lass whose fate is sealed by dint of her father's frailty. 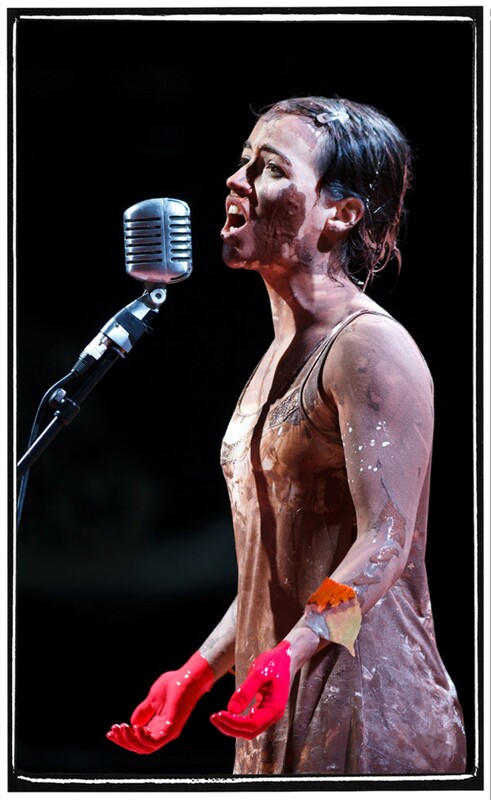 She's the Berkeley Rep equivalent of a manic pixie dream-girl, virtuous even after the devil (Stuart McLoughlin) orders her father (Stuart Goodwin) to bathe her in mud, chop off her hands, and sully her skin with blood. Patrycja Kujawska, the "wild" woman, is slightly older but equally endearing — she's the one who captivates a prince (also played by Goodwin) with her costume of branches and toadstools. Yet it's the muscular Éva Magyar who makes the wild bride seem fierce and formidable, after she's been screwed over by multiple men, tossed from a castle back into a forest, and forced to become her own lady of rage. Lest you have any doubts about the moral subtext, rest assured that it's not exactly a subtle play. And fortunately, Rice manages to have a sense of humor about that. "For a feminist folk tale, this book ain't half-bad," the devil jokes at the beginning of Act II. Kneehigh also leavens some of the gravitas by rendering Wild Bride as a musical. All the actors play multiple instruments — McLoughlin, for instance, handles guitars, banjo, and percussion, while Brisson sings and plays accordion. And the score, composed by Stu Barker, has the kind of darkly romantic cast that only enhances its fairy tale aspect. Not to mention it sounds very Frenchy, which is apropos of Berkeley Rep's holiday tradition — the company's 2009 cirque nouveau, Aurélia's Oratorio, had many aesthetic similarities. Thus, it also meets the Rep's goal of showcasing material that's historic and classical on one hand and visual, vibrant, and new on the other. The company took a great risk choosing Wild Bride — it's a hard play to stage, and could have gone horribly wrong with a clumsier director at the helm. But this version is extremely well-conceived. And there's a slow enough lead-in that, by time Magyar raises her fists triumphantly at the end, the gesture seems warranted.